As with its other eight albums, the band on this 2013 Christmas album is the embodiment of playful and seductive jazz, with gorgeous vocals by Marilyn Older. Full of wit and charm, with a martini always within reach, this is the one I have played most often over the past few years. Cool, yet festive, this mix of originals and holiday faves enables you to both enjoy the season while letting your mind wander. Whether you’re trimming the tree or wrapping presents, you find yourself humming and swinging along. In lesser hands, this would sound annoyingly cute or, worse, self-indulgently retro. Not these fine six folks, with Older effortlessly evoking the classic vocalists of the 1950s and Charlie Barnett leading another four of the most accomplished jazz musicians in the Washington, DC, area. Together, they are sublime. The highlight without a doubt is “Snow Day,” which brings back memories of all those days off from school. But this time around it’s a day for adults in love to spend a day playing outside in the snow without a care in the world. 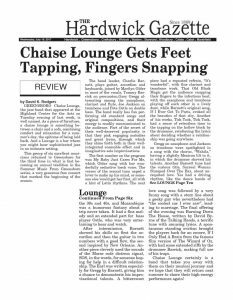 Chaise Lounge has a show, holiday-themed, I think, coming up at Washington’s Blues Alley next week. If you are anywhere near, catch them. I did a couple years back and I still tingle from that performance. We love this kind review from a stop on our New England summer tour.